Who's afraid of the big, bad Heat? 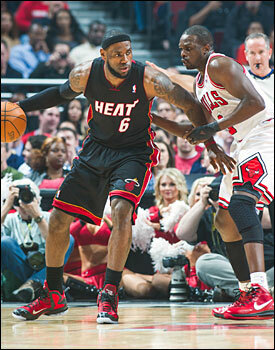 Are the Bulls chasing the Heat, or vice versa? When you ask members of the Bulls to talk about the race in the Eastern Conference, it’s a reasonably safe bet that they’ll say they’re chasing the Miami Heat. The Heat, after all, defeated the Bulls in last year’s Eastern Conference Finals in five games before falling to the Dallas Mavericks in the NBA Finals. Miami players, however, are giving a different response to the same question. “They’re the best team right now in the NBA,” Heat guard Dwyane Wade said of the Bulls following Miami’s shootaround at the United Center on Thursday. “They can say something nice about us and we can say something nice about them, but at the end of the day, they’re a helluva ballclub. A heckuva team. Indeed, entering Thursday’s nationally televised contest, Chicago owns a three-game lead over Miami, as well as the best record in the league at 44-14. But obviously given the outcome of last season’s playoff meeting between the Bulls and Heat, the edge still goes to Miami, right? Miami’s LeBron James was less forthcoming about which team he believes is doing the chasing. Consistency has not been the Heat’s strong point as of late. In its last ten games, Miami has gone 5-5. Most recently, the Heat allowed the Celtics to shoot over 60 percent from the field in a 115-107 loss at home on Tuesday. That’s not exactly the sign of a team nearing its peak for the postseason. Heat coach Erik Spoelstra, who also reminded reporters that his team trails the Bulls in the standings, didn’t shy away from the importance of Thursday’s game. 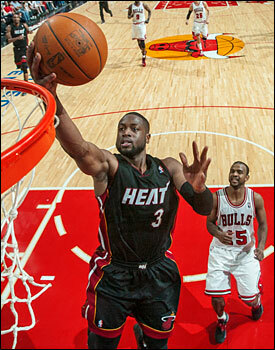 “It’s an opportunity for a signature road win,” said Spoelstra. When pressed on how close he feels Miami is to reaching a desired level of play for the postseason, he continued with that theme. The Bulls will try to prevent that win from coming Thursday at the United Center. And given the teams face each other one more time this season—next Thursday in Miami—players on both sides understand what is up for grabs. For the Heat, of course, it’s the opportunity to surpass the Bulls and enter the postseason as the Eastern Conference’s top seed.